A visitor to one of the most beautiful French villages, Cardaillac, may find row-upon-row of uniformly-styled houses. That is, until this homogeneity in design is suddenly interrupted by a modern masterpiece nestled right in between its monotonous neighbours. Sarl Hugues Tournier has taken on the project of inserting an unprecedented modern home in this sloped landscape—a very exciting undertaking indeed. 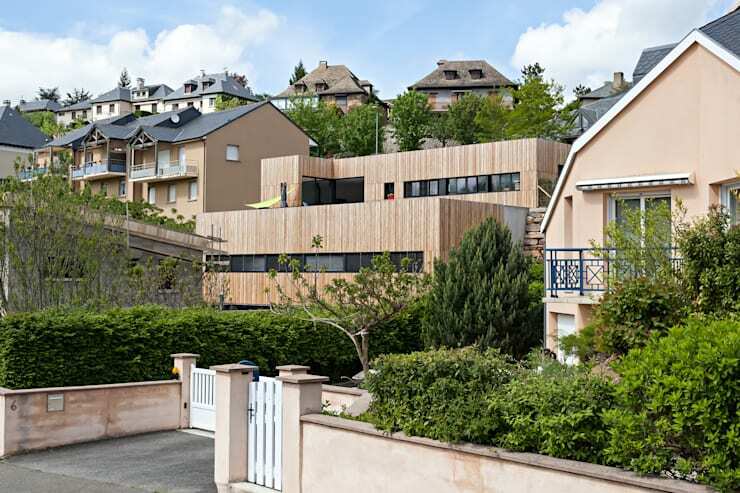 Its timber cladding should disguise the house amongst the natural landscape and neutrally-coloured neighbouring homes but it does quite the opposite. It is unmissable! The Maison Cardaillac is distinctively reminiscent of Bauhaus architecture with its marriage of fine art and industrial design. It is an exemplary functional, modern structure unified even in its varying perspectives. There is no doubt that this building is an architectural victory as it most successfully combines beauty and practicality. Join us to explore this sensational home! 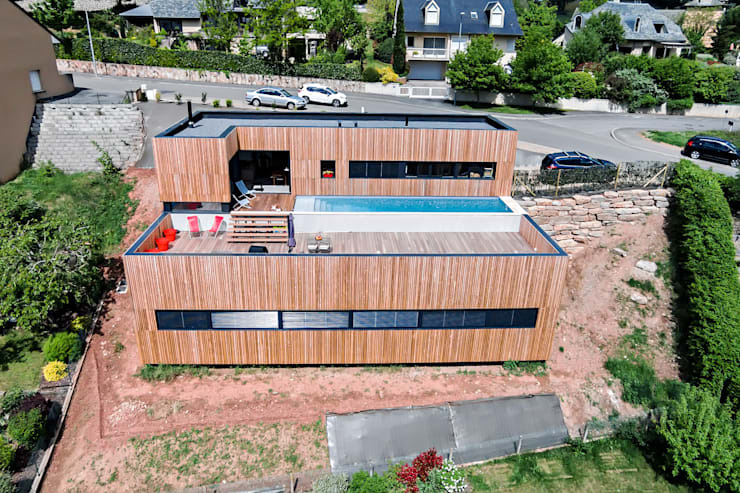 A bird's eye view of the Maison Cardaillac is quite impressive indeed. From this vantage point the front elevation of the house is also visible. It consists of two storeys, the second being much smaller than the first. It looks like two rectangles of varying size place one atop another. The space left vacant on the roof of the bottom structure is transformed into a deck and pool area—an excellent use of the space. The house is actually leading down from street level with the top floor containing the entrance and the leading out to the driveway. The house also makes use of solar panels, making it energy-efficient and a sustainable project. The ground area around this newly established home is still any empty canvas for opulent vegetation. The possibilities are endless! Walking down just the right road in Cardaillac, the view is uniform until we come upon the façade of the house under inspection. It is clearly a ground-breaking home in this village. The owner must be the envy of the neighbourhood! The use of timber across the façade of the house creates a striking image yet it suits the natural surroundings, and also does not vary too much in colour from surrounding houses. This firmly grounds the house as a rightful occupant of the space and permanent fixture. The horizontal window inserts perfectly compartmentalises the different levels to ensure the depth of the structure is noticed. From this side view we can clearly see the incline on which the house is built—a remarkable design in itself. The large, ground level structure of the house is topped of with another rectangular structure about a third of its size. 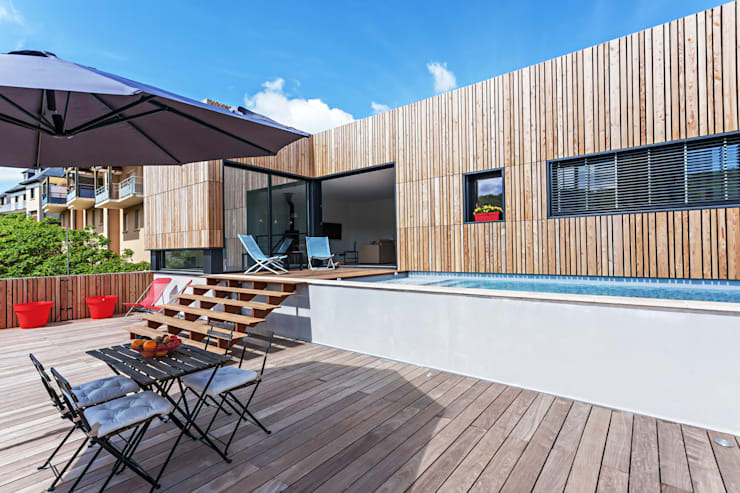 This not only allows for ample space to install a beautiful sun deck and pool, but also balances the structure—since the house is built on a slope, the bulk of the weight is concentrated at the back due to the second level, so as to work against gravity. The elevation of the driveway on street-level is reinforced by roughly stacked, natural stone wall which blends right into the landscape, and with the help of hedge on top of it, ensures that the family car does not overstep and come tumbling down. Now we get into the heart of the matter. Entering deck-side through large steel-framed, glass doors, we find ourselves in a charming living room. It has the distinctive holiday feel, with the easy colours and minimal decoration. 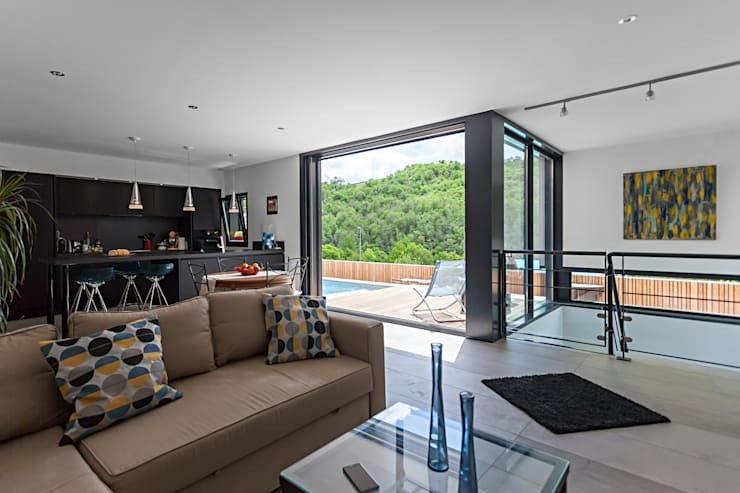 This is absolutely a theme throughout the design and in the ethos of the building—a relaxed haven which is as much a luxurious retreat as it is a sustainably responsible home. If there is a theme in this space, it is certainly cubism and other geometric patterns. This is well-matched to the home's exterior, and relevant to the nostalgia of Bauhaus design. Strong black elements reign throughout the permanent fixtures in the area, and this is counter-balanced by the neutral colours of the living room furniture. Glass also features prominently and recurrently, aiding the balance between the softness of neutrality and the bold dark colours which are strategically place about the room. 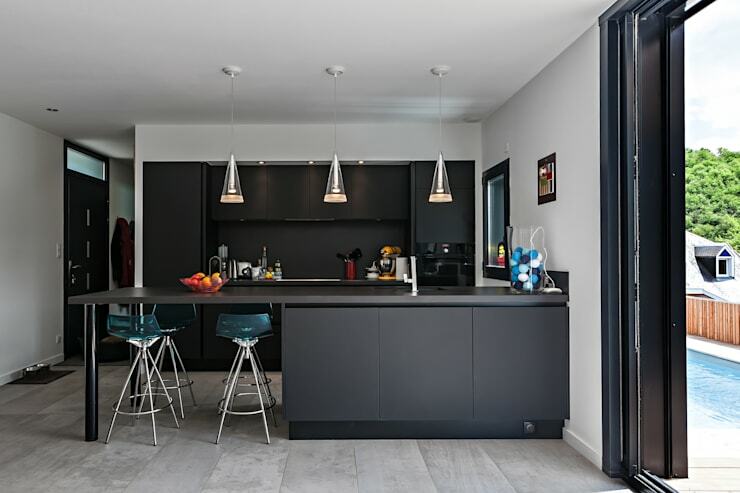 The all-black furnished kitchen brings a sophisticated balance to the otherwise relaxed atmosphere. The cabinets and counter tops are all decked in a charcoal hue which makes the white space of the kitchen around it look much bigger. The wooden laminate used for the flooring throughout this area is in a light grey hue that is very fitting to the dark kitchen furnishings. This tone of colour is repeated in the triangular lights hanging in a steady pattern above the main kitchen counter space. An all-black kitchen looks mysterious and beguiling. It is also very stylish and can be timeless, as black tends to be. It can surely be overwhelming as well but, if it is done right, it can look as wonderful as the kitchen in the Maison Cardaillac. Here are some more black kitchen ideas to try out. We have saved the best for last! The deck of this house is unquestionably the feature space of the ensemble. It is prominent in both the exterior architectural design, as well as in function. Coming out from the large glass entryway on the top floor, we find a small deck with minimalist stairs leading down from it, much like an old-styled stoop. This area is also level with the lengthy and clear pool. But this is not were the space ends. Moving down there is a larger deck filling the remainder of the first floor rooftop. It is all covered by light timber which is not the same—but similar—wood used to cover the walls of the house. A unity of design is imposed by this, pulling the whole space together. The trendy and comfortable patio furniture will make this not only the social gathering space of the house, but of the entire village! 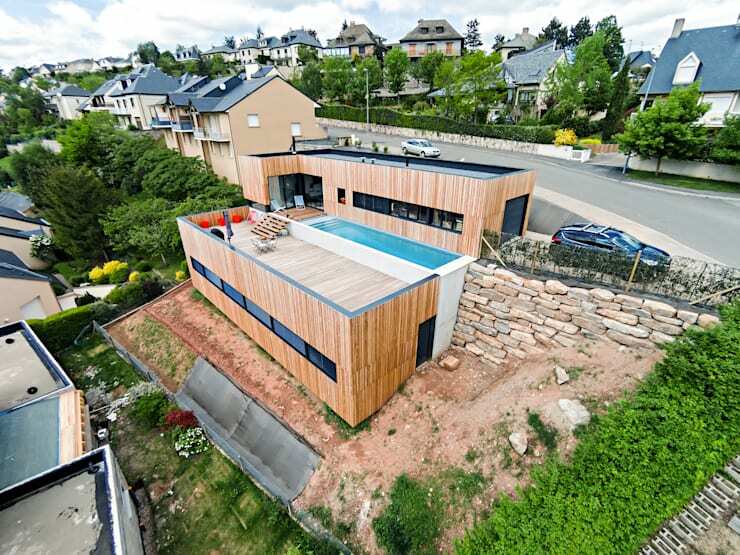 What do you think of the Maison Cardaillac? Let us know in the comments, below.